UK fans have had to wait four years to see Counting Crows on stage again, but they’ll hardly be complaining in 2013: to coincide with the much awaited tour, the San Francisco rockers are about to release their newest collection of live songs Echoes of the Outlaw Roadshow on 8th April through Cooking Vinyl which will compliment other official live recordings the band has released. 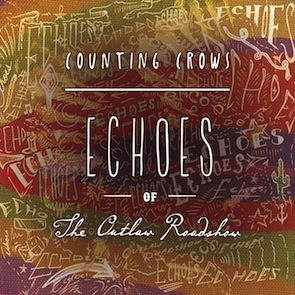 Counting Crows followers are in for a real treat with this collection of audio footage which was recorded on several dates of their North American tour in 2012. The band’s performances have been renown since the early 90s for their energy and uniqueness: no two shows are the same, with Adam Duritz constantly rewriting songs and mixing them up live for an evening always full of surprises. "After having one of the best and most adventurous touring years of our career, it's really satisfying to collect some of the best moments and document them for everyone to hear. I'm glad we didn't just let the moment pass us by." Says frontman Adam Duritz. Counting Crows have sold over 20 million albums, including 5 Top 20 studio albums in the UK (3 of them charting in the Top 10) and all 5 hitting Top 5 on the Billboard 200. The band’s 1993’s debut August and Everything After went platinum seven times, and their first official live release ‘Across A Wire: live in New York City’ was also platinum in the US and reached n.27 in the UK. Their latest studio album, 2012’ Underwater Sunshine (or What We Did On Our Summer Vacation), is a collection of more and less known songs ranging from the 1960s to our days; Underwater Sunshine was Counting Crows’ first independent release. Counting Crows’ line-up for both the live album and April tour features Adam Duritz (vocals), David Bryson (guitar), Charlie Gillingham (keyboards), Dan Vickrey (guitar), Jim Bogios (drums), David Immergluck (guitar) and Millard Powers (bass). Tickets are £33.50 adv Reg / £36.50 Bristol / £37.50 London (all subject to booking fee). Online tickets available from http://www.ticketmaster.co.uk or http://www.livenation.co.uk. Lucy Rose is supporting. Please check www.countingcrows.com for more info.